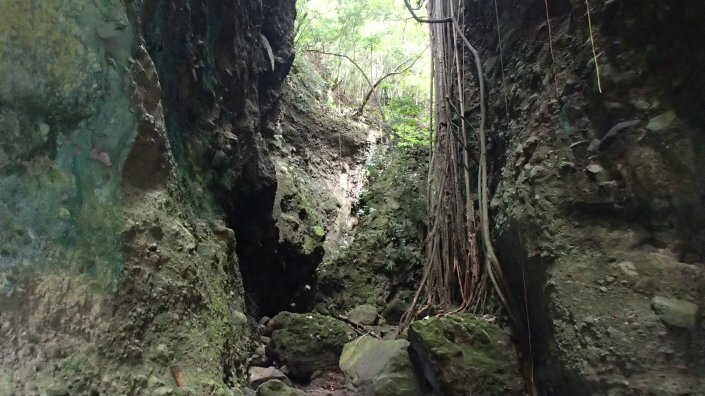 Time: 2hrs round trip to the bat cave; 3 to 4 hrs roundtrip to the waterfall (about 30 minutes past Bat Cave. Gradual incline up a riverbed. Rock scrambling throughout. Expect the trail to be wet, even in the dry season. Not dog friendly; though a small/toy size dog would be okay. Driving left out of the Ross main gate or clockwise traveling through the west farm region along island main road. 5 to 10 minutes from Ross Vet School, depending on rate of travel, you will see a long green cement wall belonging to the Challengers Day Care Center on your right running parallel to the road and on the left a basketball court. At the end of the cement wall, make a right turn onto the dirt road. Drive up the hill, bearing left and drive to the end of the road across an old railroad. Park here. When standing in the parking lot, to your left you will see an old railroad bridge trestle. Do not go this way, instead proceed through the burned out cane field in front of you. Up ahead you will see a path headed into the woods, this path will take you down into the creek bed. Once you reach the creekbed, turn right. The first section of creek bed is relatively easy to traverse, winding its way upwards towards the mountains. There is one section that is narrow and can completely flood out in the wet season and/or after a good soaking rain. If that section is flooded, you can bypass it by climbing onto the right wall and working your way along that wall until you make it past the flooded section. The boulder as we so call it is a 15 foot tall rock that blocks the entire riverbed; it is reached within 20 minutes max. of starting this hike. 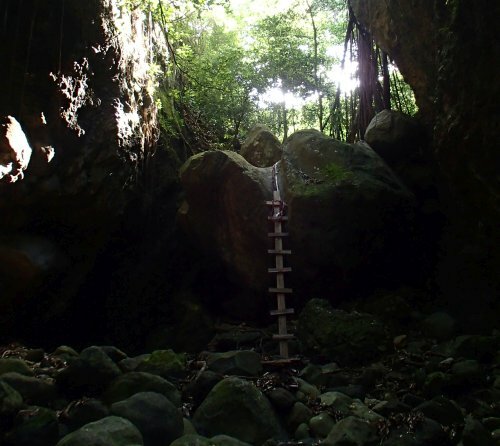 There is a wooden ladder affixed to the face of the boulder with two new sturdy ropes. Be careful when climbing the ladder, the rungs are somewhat loose so try to step as near to the center as possible. Once past the boulder continue to follow the creek bed upstream. At one point you will come to a fork in the riverbed, stay left. From that fork it is about another 10 to 20 minutes walk to reach the Bat Cave. If you wish to continue on to the waterfall bear left around the bat cave and continue following the creekbed upstream. In about 200 feet you will encounter a short waterfall, the only way to get past this point is to actually climb the waterfall itself which is actually easier than it looks. Once past this waterfall walk another 10 minutes or so till you encounter another small waterfall. Only after exceptionally dry spells will you be able to make it any further than this. If it has rained recently, there will be a large pool of water between you and the ropes you need to climb leaving you with no way to get to them. If you make it up those ropes, follow the streambed for another 10 minutes or so to reach the waterfall. Waterfall is roughly 30 feet though it barely runs. Trail conditions change frequently and drastically; do not assume that the trail will be the same from one day to the next. If it has rained in the previous week, expect to get wet and too likely make it no further than the bat cave. Ropes and ladders on the boulder are not always present and how they are configured frequently changes; thus keep in mind that the ropes may be configured very differently than how it is described above. Parking is minimal at this hike; room for 2 maybe 3 cars max so carpooling to the trailhead is a must. River bed has tested positive for lepto in the past so it would be wise to leave the dog at home. Walked this route yesterday and was fantastic walking up the gully. One thing I would warn is that the ladder over the boulder has broken, so only goes up about 2/3 of the way, there is a rope and a short two step rope later from the top but getting up (and back down) was a little precarious, but worth it. Waterfall just past the bat cave we went up the right hand side using the roots to help climb the rock to save getting our feet wet. On the way back down my feet were wet so came down the waterfall, which indeed was easier. Found another couple of waterfalls, not sure we found the main one at the top, came to one about 20 feet tall which we did see a rope up to the left, but looked too much so we headed back down. We went to the Bat Cave today (skipped the waterfall because it hasn’t rained much and we read that the waterfall is a little *sad* most of the time). It was a lovely hike, the description above complete and accurate. The only difference is that the ‘white cement wall’ which is the indication to turn off the main road while you drive to the trail head, is now GREEN! Looks recently painted. So, look for the green cement wall on your right, and basketball courts on your left. We ended up using GPS to get to the correct spot, and that worked out fine. Just did this hike in February of 2018. My amendment to the directions is to turn immediately right after the Challengers Day Care Centre (and its wall), which is now painted green. DO NOT TAKE THE IMMEDIATE RIGHT after turning right past the day care. Continue up the paved road in front of you, veering slightly left. Once at the top of the steep hill, turn left and you will see the mentioned railroad bridge. Parking is indeed minimal. The hike to the bat cave was beautiful and easy (but also full of poop so watch out). Had no problems with the ladder on the boulder. Very cool to see the bats flying around in their natural habitat. Also: for tourists, St. Kitts is a rabies free island so don’t worry about rabies on this hike. My boyfriend and I decided to continue to both waterfalls. There were 3 pretty difficult climbs on the way to the waterfalls. I am not a very experienced climber. My boyfriend is, and he had no problem, but I had a ton of difficulty getting up and down with the ropes. So watch out and be careful! The first waterfall had zero water and the second, very little. Not much to see, but still rewarding to make it up those climbs. I’ll be arriving on a cruise ship Mar 20th. Can I get a taxi from Basseterre to the trailhead and back? Will the taxi drivers know where to go? Hope that helps! There are a few updates in the comments that might help with directions as well. We are working to update the site so hopefully will have even better instructions in the future, any input you might have after your trip would be very appreciated! Have a great time in St Kitts! We were driving ourselves and found it easy enough from the directions. Where to park was a little more confusing. As I remember it was not that far from Basseterre but I would get the location on Google Maps yourself to be safe, and get the number of the Taxi so you can call and get them to pick you up again after your hike. Have fun, it is a great walk. So different.